Explanations range from UFOs to divine intervention following the installation of controversial clergyman the Rt Reverend David Jenkins as Bishop of Durham. But for those seeking a more rational explanation, it's believed the cathedral was struck by lightning. The 8 July had been a balmy summer day with spectacular storms that night. Bob Littlewood, superintendant of works at the time believes the lightning earthed through an electrical panel in the roof starting the fire just after midnight. 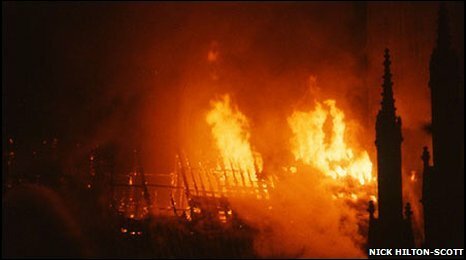 By the time Ron Hunter, the on duty Minster Policeman discovered the fire, York's cathedral was well alight. 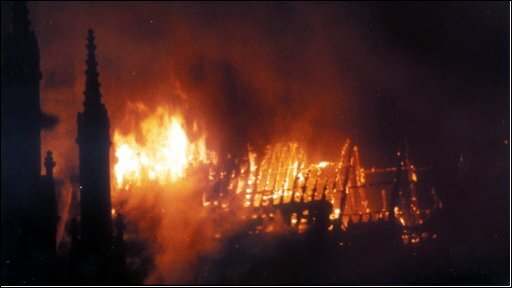 Because the exterior of the roof was effectively sealed with lead and the fire was well established at the only entrance to the roof void, it was impossible to tackle the fire effectively. The large quantities of tinder dry oak in the roof burned well, and hot. 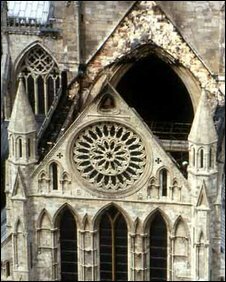 A great deal of stonework was seriously damaged, as was the famous Rose Window. It's known the Rose Window itself reached temperatures of around 450 degrees centigrade. The roof finally collapsed at around 4am. It was then relatively easy for the fire fighters to deal with the burning timbers on the floor. "That particular Sunday evening my wife and I were standing in the back bedroom watching lightning. At around midnight the phone went and it was the Minster policeman. He said 'Bob, I've got a fire' I immediately thought, 'oh it's another false alarm on the detection system'. I asked where and he said 'South Transept'." They started clearing up straight away and was the start of a long restoration process using traditional materials and methods, rather than modern. The reconstruction took four years and cost £2.25 million. One of the biggest restoration projects was the Rose Window. Designed in the 16th century to celebrate the marriage in 1486 of King Henry 7th and Elizabeth of York. This marriage finally brought to an end the 'Wars of the Roses'. "After my initial investigation, I was able to say that although the Rose Window was as terribly damaged as it could possibly be, I was quite convinced the window would shine again. I think they were the most cheerful words spoken that morning. "I had noticed that some of the glass had become detached from the leadwork and those pieces could fall. In the three weeks it took to put the scaffolding, I went up the 105 steps to the ledge round the window six times a day to carry out remedial work. I'm quite proud to say that no glass was lost. "When the scaffolding was put up the time came to take the glass out. The glass was cracked into something like 40,000 pieces. If you imagine a piece of glass the size of the palm of your hand cracked into 300 pieces, that gives you an idea." 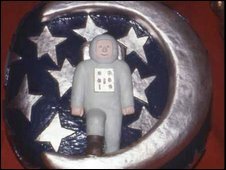 In 1986, the children's TV programme launched a competition to find six boss designs with a modern design for the Minster's vaulted ceiling. Rebecca-Rose Walsh was the youngest winner with a design showing a man on the moon and 16 year old Joanna Biggs' design reflected the raising of Henry VIII's flagship the Mary Rose. Four years later and the Minster was at last fully restored, but with some small, but significant changes. The carvings on the original bosses was a simple foliage design, but the Dean at the time decided on something more interesting. So the carvers were each given a theme from the creation of the world and allowed to interpret the verses through their carvings. There are also six small bosses that are the only pieces of medieval timber to survive the fire and the fall from the roof. The most important changes however, were to the safety and fire detection features with a more sophisticated system installed and improvements to the lightning conductors. The new roof and ceiling structure is compartmentalised, so should a fire occur again it will be contained in a small area and be easier to tackle. A 25th Anniversary Commemoration Service will be held in York Minster at 12.30pm on Thursday 9th July. What changed after the fire?